Short Peace is a hard game to write about. Mostly because it isn't really a game, really. It's hard to say I played it even. It was more of an experience, really. If you're not familiar with Short Peace, it's a collection of four animated short films and a game all packaged together and meant to be parts of a larger whole. All of these, the game included are meant to be representative of a time period in Japan, including the future. The entire package is a good one, and is quite enjoyable, though the films definitely outshine the game. Posessions is an amazing short film. So amazing, in fact, it was nominated for an Oscar. That's right, a damned Oscar. The film itself is highly reminiscent of something Studio Ghibli would put out. A wandering traveler seeks asylum from a storm only to meet a series of increasingly strange spirits, each with their own challenge. It's short, but sweet and a joy to watch. The computer-generated visuals and art style are very endearing and I find myself returning to watch Possessions often. If you like anime, or just appreciate quality animation and storytelling, you need to see Possessions. Combustible has won a couple of prestigious awards in its home country, and it's not hard to see why. Of the four films on offer in Short Peace, Combustible is easily the most beautiful. It's a story about blossoming affection between two childhood friends set against Japan's feudal era. As the name would suggest, Edo is engulfed in flames and makes for some absolutely striking scenes. Once you watch it you'll have no doubt Combustible deserves the accolades it has earned. Gambo is an another Ghibli-like story of a little girl who forms a connection with a mysterious white bear. The bulk of the film focuses on a gruesome battle between an Oni—a Japanese red demon—and the bear, as well as some soldiers. Gambo does a great job of conveying the little girl's emotions to the viewer, it's a really powerful short. A Farewell to Weapons follows a small military-like squadron in a battle against an autonomous tank inhabiting a long-abandoned Japanese city in a dystopian future. It's a fun watch, but nothing that strikes a deep emotional chord. Some scenes definitely had me on the edge of my seat, but it paled it comparison somewhat to the other three stellar pieces on offer. 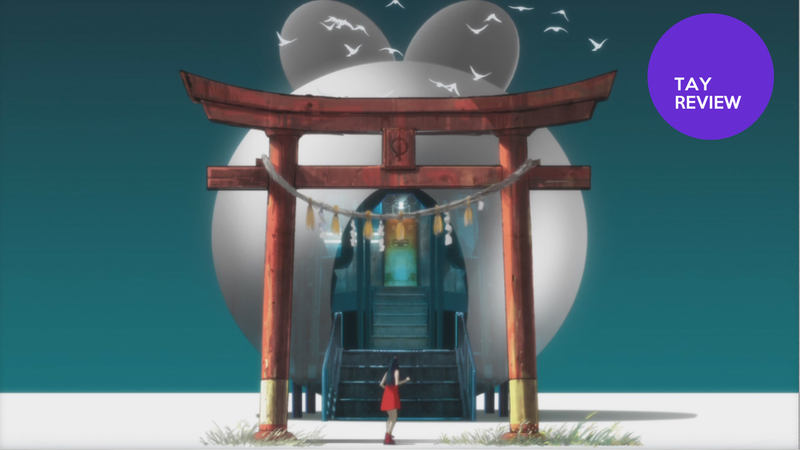 The only interactive media in the Short Peace collection is Ranko Tsukigime's Longest Day. The story is set in present-day Japan and follows the titular heroine on an assignment to assassinate her father. The story was written by (surprise) Suda 51, with the game itself being developed by Bandai Namco. Longest Day is a short, simple, addictive game. You'll guide Ranko through stages running mostly left to right while slicing through enemies while avoiding the ever-present threat of advancing spirits threatening to capture you. Killing enemies causes them to explode and send colorful debris flying about which can make contact with and kill additional enemies to form a chain. Killing enough enemies will fill up your bullet gauge which you can use to fire behind you in case the spirits have gotten too close. As you get deeper into Longest Day, you'll find some welcome variations on the game's model, including a vertical platforming boss fight, an R-Type style shooter stage and an 8-bit style boss battle. The game lasts only about 30 minutes total, and is more of a vehicle for a story told via cutscenes shown in varying art styles. All in all Ranko Tsukigime's Longest Day is no more a full-fledged game than Short Peace's other components are feature-length films, and that's okay. What is here is fun, albeit fleeting. Short Peace is worth is just for the first three shorts, all of which are excellent. Shuhei Morita's Possessions, Katsuhiro Otomo's Combustible and Hiroaki Ando's Gambotell amazing stories and do an excellent job. Hajime Katoki's A Farewell to Weapons, which is coincidentally based on a manga by Otomo is a solid film that's fun to watch and Ranko Tsukigime's Longest Day is a fun distraction of a game to play when you don't have a lot of time. In short, there's no weak link here. Short Peace is a great piece of entertainment that deserves a spot in your PS3 library.